Have been ask to start a blog and have created the accounts since years back but fail to update the blog. Because I am not good in writing, think now I should and since I am not goods in long composition I will start with short sentence and with photos for my blog. 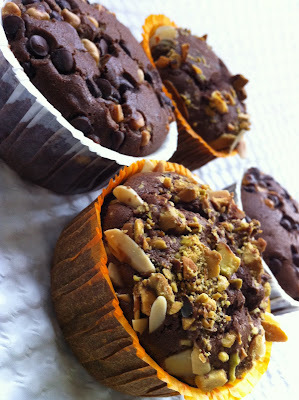 The blog name "Scrumptious - Flavours" was suggested by my customer from Adelaide Mr. Trevor William. He always travels to Singapore once every 2 months and will sure visit my shop very day for coffee and have an hour chat with me. During his recent visit I happened to bake my BF favorites Muffin and he was offered to have one. His comment was the muffin is very moist and he likes it. This recipe I made was a pre-mix muffin from PH. It was so easy to make and only takes 10 minutes for the whole mixing. • Mix all the ingredients in the mixing and beat at medium for about 6 minutes. • Bake at 170º C for 25 to 30mins. Make around 14 muffin with this muffin casing from PH. I welcome comment and feedback.